My FTTC speed is slower than it has been in recent weeks and I havent had any disconnects for the last week? 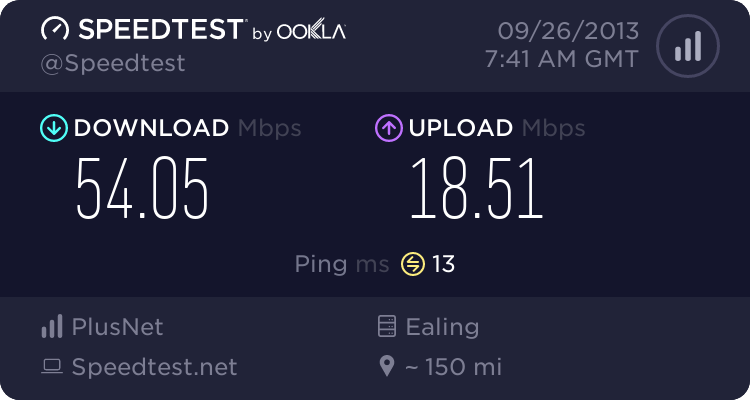 the BT wholesale speed tester always reports very low speeds (when it works as sometimes it doesnt) and other speed testers are ranging from 30Mbps to 40Mbps down and about 10 up, I normally get about 55Mbps to 65Mbps down and 18.2Mbps to 18.5Mbps up. 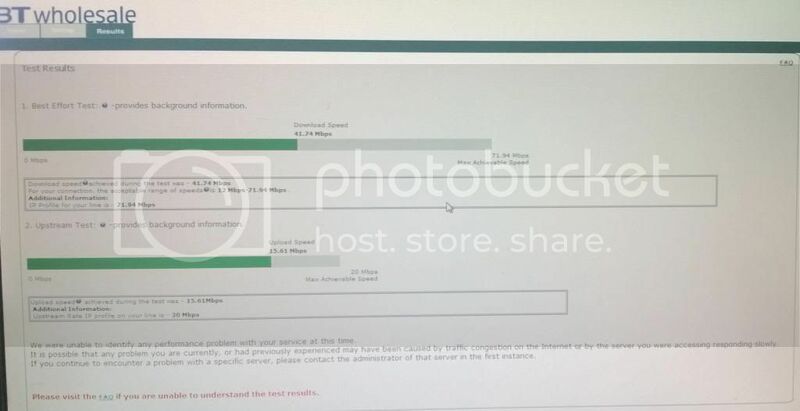 My speed apears to be back to what it normally is by think broadband and speedtest.net speedcheckers, but I still dont get why it dropped so much this evening? The BT wholesale checker is still reporting lower speeds than other sites! Mine is one of those graphs affected, on pcl-ag01 if that's relevant. At any given moment in the universe many things happen. Coincidence is a matter of how close these events are in space, time and relationship. Opinions expressed in forum posts are those of the poster, others may have different views. Well after that is when I got a good rise in speed back to normal so I guess I must have been effected, I wonder if there was a fault causing that? 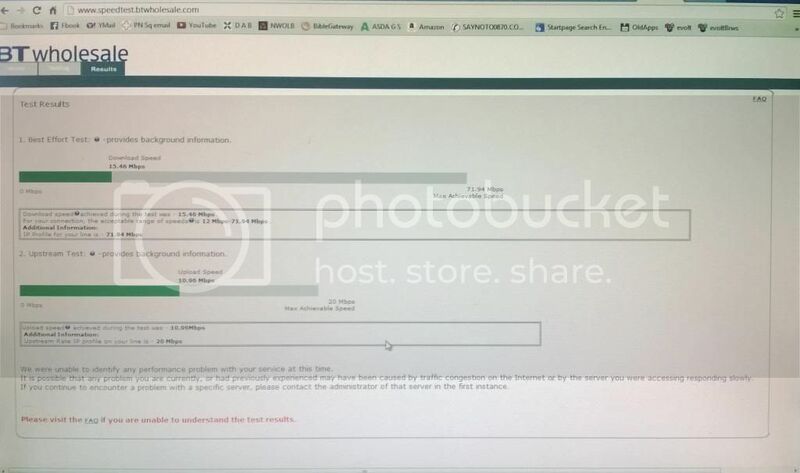 Hopefully people can see the BT Wholesale pic, I couldnt do a screenshot for some reason so I did the next best thing. Anyways as can be seen there is a big difference between the first two tests and the BT test! can anyone explain the big differences? the number of people trying to access the test server will have a massive impact on its ability to provide accurate data. its looking better from the BTW tester now: but its still not showing the speeds that other testers are showing! I believe that the BT tester uses multi-threaded HTTP and that seems to compare rather closely with your TBB 'HTTP x6' test results. Most people get as good (or better) with HTTP x 6 than with the TBB custom (green line on graph) but I have discovered that the HTTP x6 and BT results can be much more readily influenced by processor speed / loading and antivirus/firewall. Just a thought.